On Dec. 12, 1915 in Hoboken, New Jersey, Italian immigrants Natalina "Dolly" Garaventa and Antonino Martino Sinatra welcomed a new baby boy into the world. As they held their only child in their arms, dreaming of what his future held, the couple likely never imagined that their Frankie would grow up to become an international music icon whose voice would resonate even a century after his birth. With Frank Sinatra's 99th birthday today, fans all over the world are remembering the legend and his music, including those in his hometown, the Mile Square City. One of the biggest events celebrating on Ol' Blue Eyes' big day is on Sinatra Drive at Little Town, at 310 Sinatra Drive. At the 5 p.m. shindig, Eric DeLauro of the Rat Pack Band Swing Orchestra, who won the Sinatra Idol singing contest in Hoboken in 2008, will perform some of Sinatra's biggest hits. DeLauro, whose family lived in the same house as the Sinatras, says he feels connected to the great singer through their shared heritage and Hudson County roots. "It's really extraordinary that a guy went from one of the poorest neighborhoods in Hudson County to becoming an international phenomena," said DeLauro. "He was the first 'American Idol,' and I think the thing that propelled him ... was his Hudson County tenacity and resilience." In addition to singing Sinatra tunes at various events, DeLauro also offers music history presentations at schools, inspired by the Hobokenite. "We think music is a great mechanism to help kids dream and inspire achievement," he said. "After all, he was just a little kid from Hoboken who had a dream." Another Sinatra tribute singer who was also inspired by Sinatra as a young boy will perform at the Hoboken Historical Museum, 1301 Hudson St., today from 7:30 p.m. to 9 p.m.
Peter Cafasso, who won the first Sinatra Idol, which was held at the museum, says he's been listening to the Voice. 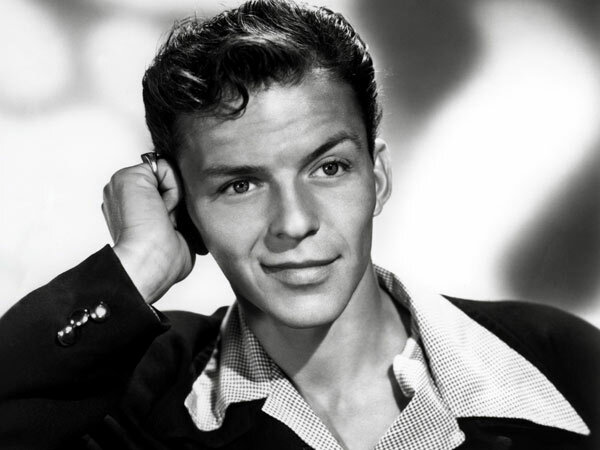 "His mother was a huge Sinatra fan and always had it playing in the house, and every time a new record came out, he'd take it to his room and practice singing along until he felt he mastered the songs," said museum spokeswoman Melissa Abernathy. Abernathy says she was at the first Sinatra Idol, when about a dozen singers came. "It was a really moving experience. There were so many fans who had grown up listening to Sinatra and for older fans it was like watching Sinatra come back to life," she said. "They had tears in their eyes and applauded like mad for every performer." Abernathy says there's just something enduring about Sinatra and his music. "He really understood how to make music and get a band to perform it at their absolute best--how to get them to play with the right emphasis and phrasing, and he really brings terrific feeling and style," she said. The Port Authority of New York and New Jersey has scheduled a major project to install new drainage systems for the George Washington Bridge anchorage. This work is scheduled to begin Monday, December 15, 2014, and to continue through the end of January 2015. * From Monday – Saturday during this time, Henry Hudson Drive will be CLOSED TO ALL USE from the Edgewater park entrance to Ross Dock Circle. Violators may be subject to prosecution. On Sundays only, if conditions permit, the closed section of the Drive will be reopened to pedestrians and cyclists only. *The dates for work on this project are subject to change without notice. WINTER USE: During winter months, some park areas are closed or have reduced access. The seasonal status of park areas is posted in the sidebar on the right side of most pages in our website. Visitors can check the Parkway Police Twitter feed for updates. Repaving of the Palisades Interstate Parkway in New Jersey remains in progress under the supervision of the New Jersey Department of Transportation. Motorists please use caution! Allow extra travel time – consider alternative routes. Check the Parkway Police Twitter feed for current updates. The transformation of the Hudson River waterfront between Edgewater and Weehawken, N.J., into a residential community for white-collar professionals is well passed its halfway point, wiping out remnants of the area’s past as an industrial and railroad hub a century ago. 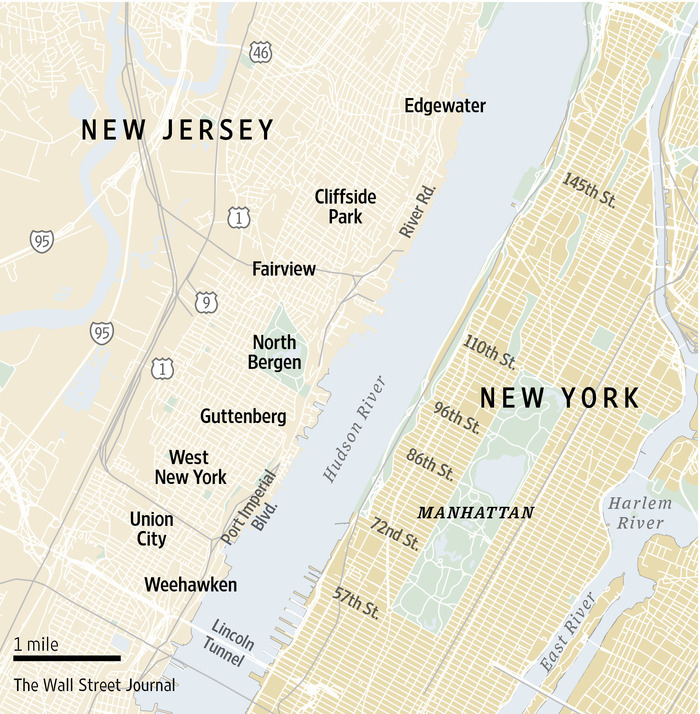 Brokers now consider the area the northern strip of New Jersey’s Gold Coast, as thousands of luxury townhomes, condominiums and rental units have attracted residents drawn by views of New York City and quick access to their workplaces most often in Manhattan or Jersey City. Although the area might appear to have little space left to develop, there are still a few large parcels in transition. Hess Corp. is in the process of selling a 13-acre decommissioned tank terminal at 615 River Rd. ; the company says a deal is pending but declines to elaborate. In addition, Mr. Daibes’s company is constructing the Alexander, an 11-story luxury residential rental building with 300-plus units that is slated to finish up by the end of the year. The units are targeted at empty-nesters and senior citizens, with on-site amenities including dining, a carwash and dry-cleaning services. “I’m trying to bring back the classic feel of old Park Avenue” in Manhattan, said Mr. Daibes, who is also developing a 300-unit rental building at 7601 River Rd., across from the Palisades Medical Center in North Bergen. 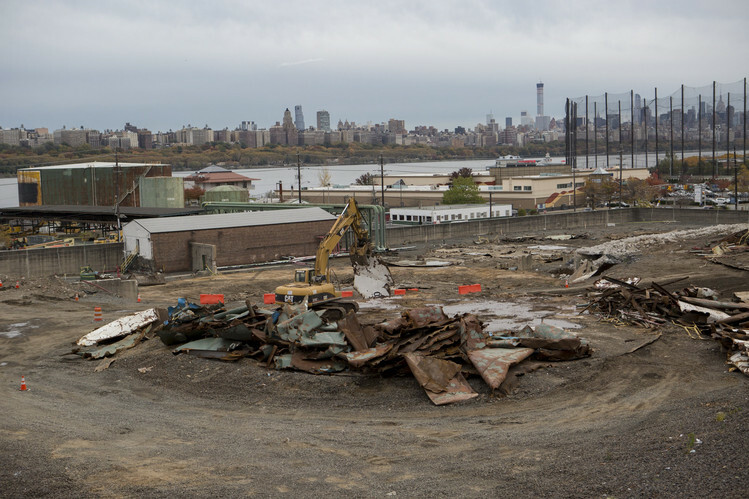 Construction also has been picking up steam farther south in Port Imperial, the waterfront area in Weehawken and West New York near the Lincoln Tunnel, where several companies are progressing on the remaining parcels of undeveloped waterfront land. Miami-based Lennar Corp. has found recent success in selling large luxury condominium units. A 74-unit building, the first of five in Lennar’s Avenue Collection complex, is about 70% sold, said Craig Klingensmith, division president at Lennar Urban, with prices for the one-to three-bedroom units ranging between $800,000 and $4 million. “We’ve had a nice mix of Russian, Chinese and Indian buyers, and some that are migrating from Manhattan, who’ve either been priced out or had little luck finding something due to the lack of inventory there,” Mr. Klingensmith said. The second building, currently under construction, will have 103 units. The full complex of buildings is expected to finish in about six years. With the construction of about 2,000 new townhouses, rental and condo units, Roseland Property, a subsidiary of Mack-Cali Realty Corp. , has now completed about half of its Port Imperial development plan. The firm is currently finishing RiverParc at Port Imperial, a 10-story rental building with 280 units. Public transportation has been a prime factor to the growth of the area, developers say. The New York Waterway ferry crosses between the Port Imperial/Weehawken terminal and Manhattan’s Midtown/West 39th Street terminal in about 10 minutes. As each new community has been built, developers have been required to construct new roads and park space. Developers were also asked to provide public access to the waterfront by adding stretches of the Hudson River Waterfront Walkway, a continuous recreational path that will, when completed, run from the George Washington Bridge to the tip of Bayonne. Some community activists say that more municipal control was needed on the design of the walkway in this area, however. Despite the onslaught of new residents along the waterfront, local officials say there hasn’t been much of an impact on traffic or schools. The school district in West New York, which has a total enrollment of about 7,800, has seen a slight increase—perhaps an added 50 preschool and kindergartners—in recent years, estimated Superintendent John Fauta. Recent development hasn’t been limited to new homes. In addition to new restaurants and grocery stores, a 226-room Marriott Renaissance and a 154-room Marriott Residence Inn are currently under construction, both on top of a parking garage adjacent to the Port Imperial/Weehawken ferry terminal. 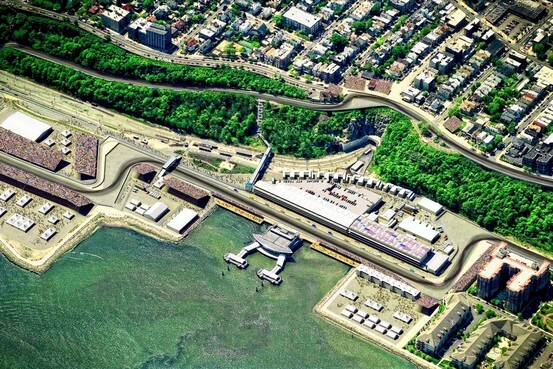 Above, a rendering of the starting line and stands for the 2013 Formula One race that is slated take place in Weehawken and West New York, N.J. Below, a course map for the race. Formula One, the most popular, technologically advanced and glamorous form of international motorsport, will hold a Grand Prix race on the banks of the Hudson River against the backdrop of the Manhattan skyline in June 2013. If the current lineup of teams remains the same, that means 24 cars racing at 200-plus mph will let loose some 17,000 horsepower on closed-off public roads in Weehawken and West New York, N.J., in front of a crowd that, if expectations are fulfilled, would double the capacity of Yankee Stadium. 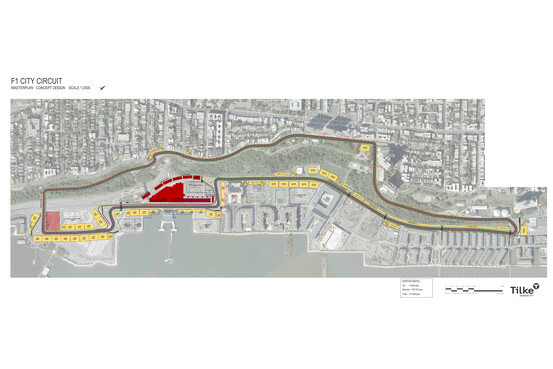 Officials made the announcement Tuesday at a news conference at Port Imperial in Weehawken, where the Formula One Grand Prix of America will be held. Among others on hand were New Jersey Gov. Chris Christie, Weehawken Mayor Richard Turner, West New York Mayor Felix Rocque and Leo Hindery Jr., founder of the investment group that will promote the event. "It's the new Monte Carlo Grand Prix on the Hudson," Rocque said. The announcement marks a major triumph for Bernie Ecclestone, the 80-year-old London-based head of F1, who for years has voiced a desire to hold a race in the New York area. The deal is in essence an agreement between Ecclestone and Hindery, the founder and former chief executive of the YES Network, the broadcast partner of the New York Yankees. Hindery is also a retired racing driver who won his class in 2005 at the 24 Hours of Le Mans. Hindery's hunt for a location suitable for F1 in the New York area took years. "We looked at Staten Island, Floyd Bennett Field, the Meadowlands," he said in a phone interview. "Nothing worked." Two years ago, Hindery got word through a friend about a potential site along the Hudson on the New Jersey side called Port Imperial. It had been an industrial mess for decades until, in recent years, a developer cleaned up the property, building a residential neighborhood surrounding a park. "Using Google Earth," Hindery said, "you could see how it would work. You could see the track. The course jumps right out at you." Port Imperial is a transportation hub, which brings its own appeal. Though Christie expects "over 100,000 people" to attend, there will be no parking lot on site. Port Imperial can be accessed by ferry, Path trains or light rail. "It will be the only true green race in Formula One," Hindery said. "Nobody gets there by car." F1 has a major presence all over the world, but not in the U.S. As opposed to Nascar and IndyCar, it is the standard bearer for driving skill and technology. While it has staged races in various American cities over the past 50 years, it has failed to find an anchor due mainly to financial issues. The last F1 race in the U.S. was at the Indianapolis Motor Speedway in 2007. "Staging Formula One is incredibly expensive," said Mario Andretti, one of two American drivers ever to win the F1 world championship. "If you know that going in, then you've got a chance. If you go in with eyes closed, you're doomed to failure. That's what we've seen in the past." In May 2010, F1 announced a plan to return to the U.S. The United States Grand Prix is scheduled to be held at a new purpose-built facility in Austin, Texas, on Nov. 18, 2012. The race in New Jersey will mark a second grand prix in the U.S. for 2013. Unlike Austin's Circuit of the Americas, which is still being built and is reported to cost $250-$300 million, the New Jersey event will use existing roads rather than a purpose-built facility. F1 already holds races on public roads in downtown areas of Singapore, Monte Carlo and Valencia, Spain, proving it can be done. "We don't put in a single foot of asphalt," said Hindery. "We build our stands, our pits and paddock club. We put up barriers and catch fences. We put it up and take it down. There's not one residence in the middle of the course. Everyone can access their home without being impeded by the track." Hindery said that, according to the contract with F1, Port Imperial will host the Grand Prix of America for the next 10 years. And the event will be staged with private money. "There will be no taxpayer dollars, no subsidies, no compensation of any sort from local governments," he said. The announcement comes at a tricky time, nine days after Indy 500 champion Dan Wheldon was killed at the Las Vegas Indy 300 and two days after Italian motorcycle racer Marco Simoncelli died at the Malaysian MotoGP. Hindery hired the German firm Tilke Engineers & Architects, which has built numerous F1 tracks around the globe, to design the course and safety features. No driver has died in F1 since Brazilian Ayrton Senna in 1994. The logistics of holding an F1 race in the heart of New York's "bridge and tunnel" intersection are mind-boggling. The Renault F1 team, for example, travels to races with two cars, a spare chassis, eight engines, 25 metric tons of airfreight (not including 18 sets of tires for each of the team's two drivers), and a staff of about 70 people. There are 12 teams currently. But the 3.2 mile track itself—with sweeping flat-out bends, sharp right and left hand corners, and 150 feet of elevation change—has racers excited. "It's the cat's meow," said Andretti. "The Manhattan skyline is recognized the world over and to marry that with Formula One will be incredible," Christian Horner, the team principal of the Red Bull F1 team, which won the constructors' and drivers' titles this season, said in an email. William O. Allison. Photo courtesy of Kyle Moore. March/April 2011 Issue: "Allison's Will"
His doctor was pleased with his recovery from the pneumonia, but then came multiple thrombosis—a blood clot in his brain left him paralyzed—and two days later, early on Thursday morning, December 18, 1924, William O. Allison was pronounced dead at his apartment on West Sixteenth Street in the city. He was buried on Saturday at Brookside Cemetery in Englewood—just a morning’s walk, really, from the Hudson River hamlet where he’d been born seventy-five years before, a river man’s son. At his death his estate was worth over $3,000,000. He was twenty-two in 1871, making his name as a sharp business reporter, when he founded the Oil, Paint and Drug Reporter, the first of the three trade journals he published. He also sat on the boards of banks, invested in real estate and railroads, and bought a failing steamship company—to turn it around. He became the principal owner of the Palisades Mountain House, the grand cliff-edge hotel just south of Greycliffs (William Dana had been among its financiers) and was staying in it the night it burned in 1884. He’d build his own house on the ruins. He shared the fruit of his Jersey gardens with the employees at his office at 100 William Street, and he led botanical societies on tours of his Palisades estate. He was forty-four in 1893 when he got into a hot dispute over an election in Englewood. After the dust had settled, in 1895, the easternmost section of Englewood had split off to become the Borough of Englewood Cliffs; he was elected the new town’s first mayor. He felt a deep pride in his “Jersey Dutch” forebears, who had wrested their livelihoods from the river. He became a vice-president of the Bergen County Historical Society. With his sons he interviewed the now ancient-seeming river folk he’d known as a boy for a book he planned to write. (Much of this work was lost when the home he built on the Mountain House ruins itself burned in 1903.) He bought land on the Palisades by the hundreds of acres. He married Caroline Hovey in 1884, and she bore him six children: a little boy and a baby girl were taken before Caroline’s own death in 1896; tuberculosis took another son, Van, in his twenties; Katherine, Frances, and John were still alive in 1924, as was Caroline Shaw Allison, his second wife, whom he’d married almost a year to the day after the first Caroline died—but from whom he soon separated. The four of them, the three children and the widow, would not be pleased to learn the contents of Allison’s will. “It is my desire and intention,” he stated in his will, “to dispose by gift of a large part of my remaining estate for the purpose of pleasing Almighty God, benefitting my fellow man, and as far as possible developing that section of the Palisades along the Hudson, located in the Borough of Englewood Cliffs and vicinity.” He named two close business associates, Harry J. Schnell and Frank V. Baldwin, as executors and “Trustees of the Trusts hereinafter created.” He made several bequests to longtime associates, but stated explicitly, “I have made no bequest … to my wife, children or grandchildren, for the reason that I have already made adequate provision for them” through trusts already established. Schnell and Baldwin were ordered to use the remainder of the estate “for the development and maintenance of said Palisades Section in accordance with my wishes as expressed to them.” He authorized the trustees to sell “any or all” of his properties to finance their efforts. The lawsuits began. The plaintiffs presented affidavits that the old man had lost touch with reality; that he had been manipulated; that he had been sick, even depraved. The defendants countered with affidavits that William Allison had been keen of mind to the very end; a warm and caring friend; a benefactor. In 1926 a court set the will aside; it was reinstated on appeal in 1927. The value of the estate was said to have ballooned to over $8,000,000; or, it had plummeted with the stock market crash. The lawsuits dragged on, into the 30s, draining the trust. All the while, Schnell and Baldwin struggled to decode the intent of Allison’s will. They opened and maintained one section of his property—about ten acres on the cliff edge near where he’d actually lived—as a public overlook and park. They installed a handsome iron fence, built modern restrooms, hired a caretaker. They mounted a plaque honoring Allison. In court they produced affidavits that Allison had once envisioned a “super university” in Englewood Cliffs—and had invited Woodrow Wilson to head it after his presidency. Had he not also spoken of wanting to build housing for working families? …a hospital? …a museum? In 1967 the struggling trust turned over the overlook park to the Palisades Interstate Park Commission: “Allison Park,” with its iron fence, its (now ancient-seeming) restrooms, its plaque from which William Allison seemed to stare with a strange, almost disturbing intensity—a son of the wild Palisades—a man of business—a private soul with public dreams. 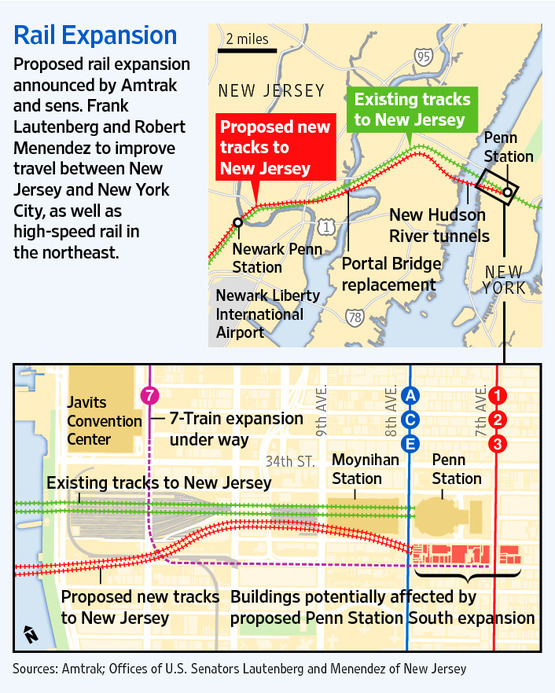 The two-tunnel Gateway project, part of a larger Amtrak plan for high-speed rail along the Northeast corridor, has been in the works for a few years but was fast-tracked after New Jersey Gov. Chris Christie canceled a similar rail project. The Obama administration has made high-speed rail a priority, and New Jersey's senators said they would try to snag money left on the table by Midwest governors who rejected projects. Gateway would be less beneficial to commuters than the canceled Access to the Region's Core, or ARC, project, because its primary goal is to speed long-distance trains between New York and destinations like Philadelphia and Washington, D.C. The extra capacity for commuter trains is an ancillary benefit. As with ARC, Gateway is expected to create jobs and boost real-estate values. Major obstacles remain. It's unclear where the money would come from. Amtrak said it is looking for private-sector partners, and one of its commissioners said the train company would "put a significant part of its capital resources" into Gateway. Mr. Christie, a Republican, said there was no New Jersey money available today, but he would consider contributing to a fair plan for the project. One of his complaints about ARC was what he called a lack of funding from New York, though the Port Authority of New York and New Jersey was paying about one-third of its cost. "We'll cross that bridge when we get to it," he said. "No one's come to me yet asking for any money." Mr. Christie seemed to delight in the Amtrak proposal, saying it reinforced his reasoning for canceling ARC in October and resolved several of his complaints, such as a bigger federal role. At the time, rail advocates said the governor's decision set the region back a generation. "A generation turns out to be three months," Mr. Christie quipped on Monday. "Sometimes to make real change happen you have to stand up and be counted and make the tough decisions. And if I had been intimidated by all the rhetoric from all the folks who were shooting at us at the time, the taxpayers of the state of New Jersey would be on the hook for untold billions of dollars." New Jersey's own estimates put ARC at $8.7 billion, but the Federal Transit Administration said it believed the project would cost between $9.8 billion and $12.7 billion, with the balance in New Jersey's lap, not including a necessary upgrade to a related rail bridge. Amtrak's $13.5 billion estimate includes $2 billion for the bridge renovations. The new proposal was hailed by the same planners and mass-transit advocates who were dismayed by Mr. Christie's decision to cancel ARC. They see it as a way to solve the same problems that tunnel would have helped alleviate without requiring Mr. Christie's approval. "Clearly what we've discovered is that New Jersey Transit and the current regime isn't going to become the solution," said Mitchell Moss, the director of the Rudin Center for Transportation Policy and Management at New York University. "This is the ideal kind of debate that we should be having." The Amtrak proposal would be necessary even if a proposed cross-Hudson extension to the No. 7 subway line proceeds, officials said. "If you're taking a train from Washington to Boston, you're not going to get off the train in Secaucus, N.J., get on a New York City subway, take the subway into New York City and get back on another train," said Anthony Coscia, Amtrak board member and former chairman of the Port Authority of New York and New Jersey. "They're different projects." That idea originated with Mayor Michael Bloomberg's administration and is still under consideration. The city is spending $250,000 on an outside firm and New Jersey Transit is giving in-kind man-hours. The Metropolitan Transportation Authority said it's looking at the idea, but has not endorsed it. No other transit agency is backing it, and it has received a cool reception from public officials on the east side of the Hudson. The idea of improving service on the Northeast Corridor has prominent supporters on both sides of the aisle in Washington, including the new Republican chairman of the House Transportation Committee, Florida Rep. John Mica. In seeking private partners for the project, Amtrak was giving a nod to Mr. Mica, who remains skeptical and has said he'd like to have a private company involved in running high-speed rail. Amtrak is subsidized and wholly owned by the federal government. Part of the plan would involve building a new annex on the block immediately to the south of Penn Station. That could encounter resistance from preservationists, who point to three buildings there that are eligible for the National Register of Historic Places. Among them are a Napolean LeBrun-designed 1872 Catholic Church and the original powerhouse for Penn Station. If Amtrak wanted to take that block and knock those buildings down, it would likely need to show that it doesn't have alternatives. "There would be details to consider in their alternative plan, including the implications of building Penn Station South," said Vin Cipolla, president of the Municipal Art Society of New York. "But major, sustainable infrastructure improvements are essential for the continued prosperity and livability of both New Jersey and New York." Mayor Michael Bloomberg said he supported another tunnel, in theory. "It gets people coming into New York City to shop and to work there," he said. "The question is who's going to pay for it. Is it practical? And at least they're trying to do it." —Michael Howard Saul contributed to this article. SATURDAY: The Hudson River Fishermen's Association Ninth Annual Surf Fishing Tournament in Seaside Park and Seaside Heights. Early registration is advised. In person registration is Friday night, Oct. 29 from 6-9 p.m. and Saturday morning from 5:30 to 7:30 a.m. at the American Legion Hall in Seaside Heights. NOV. 6: Jersey Coast Shark Anglers 18th Annual Striped Bass Tournament. $12,000 in prize money. Prizes based on 150 boats entered. First prize will be $4,350; 2nd, $3,300; 3rd, $2,700. Entry Fee: $150 per boat and $75 per surf fishing angler (separate prize money). Weigh in: 3 - 5 p.m. at Crystal Point Marina. Awards will be presented at the JCSA club party at 5 p.m. on Nov. 6. Captains meeting Friday, Nov. 5 at the JCSA Club at 385 Herbertsville Road, Brick at 7 p.m. One representative from each boat and all surf anglers must attend captains meeting. For additional information call (201) 832-4822bradporrino@sanzari.com, or visit www.jcsa.org. NOV. 20: Rahway's Fall Fishing Flea Market, St. Thomas Church Hall, 1400 St. Georges Ave. Rahway. Wide Variety of Salt & Fresh Water Fishing Tackle on display. New, used, antique, and custom fishing and boating items. Door prizes (rods, reels, tackle and more) given away every half hour. Food and Refreshments sponsored by St. Thomas Holy Name Society. Show hours: 9 a.m. to 2 p.m. For show or vendor info call (732)381-2165 or visitwww.fishingfleamarkets.com. NOV. 26-28: Sixth Annual Big Daddy 40 Hour Striper Tournament. Starts Friday, Nov. 26 at 8 p.m. and ends Sunday, Nov. 28 at noon. There are two entry categories: $100 entry fee for boat fishing; $30 entry fee for the surf fishing. Prizes determined by amount of entries. For additional information call Keith at (732) 237-5756. Entry forms available at Leggetts Sand Bar, 217 First Ave., Manasquan. DEC. 5: Freehold Fishing Flea Market. 9 a.m. to 3 p.m. Admission: $4, kids 12 and under free. Park Avenue Elementary School, 280 Park Ave., Freehold. For more information contact Dave DeGennaro athiflierfising@verizon.net or call (732) 330-5674. The flea market offers space for over 75 exhibitors. The show will feature a wide assortment of rods, reels, lures, boating and nautical items for sale. FEB. 5: Raritan Bay Anglers Fishing Flea Mkt at St. Cecelia's Lourdes Hall, 2011 Oak Tree Rd./Rt 27, Iselin. 8 a.m. to 2 p.m. Contact: Jim at (732) 494-6826, email at jdago1@yahoo.com, or visitwww.raritanbayanglersclub.com. FEB. 12: Hi-Mar Striper Fishing Club Fishing Flea Market. Middletown VFW, 1 Veterans Lane off Route 36 East, Port Monmouth, 8 a.m.-3 p.m. Contact: Capt. Jerry Beaver at (732) 671-1442, email at JerryBeaver@comcast.net or visitwww.Hi-Mar.com. Admission: $5. MARCH 13: Asbury Park Fishing Club's 19th Annual Fishing Flea Market, Convention Hall, Ocean Avenue, Asbury Park. More than 30 of the nation's top plug builders will be on hand, along with new and used fishing tackle. With No Government Guarantees On Cost Overruns New-Jersey Governor Christie Ends "The New Hudson Rail Tunnel"
Oct. 27 (Bloomberg) -- New Jersey Governor Chris Christie ended the largest U.S. mass-transportation project, saying the state couldn’t afford the potential cost overruns of a commuter- rail tunnel under the Hudson River to New York. Christie, 48, a first-term Republican, said the decision is final, ending a review of ways to save the project that began more than two weeks ago at the request of U.S. Transportation Secretary Ray LaHood. The governor halted work Oct. 7, citing concern that the initial $8.7 billion price might rise as much as $5 billion. The tunnel was designed to supplant a century-old link shared by New Jersey Transit and Amtrak, the U.S. intercity railroad. It would double the number of trains that New Jersey Transit, which has reached capacity during peak times, can run into Manhattan, according to the project website. Christie said the decision followed an “honest and frank” discussion with LaHood. The state is interested in working with Amtrak, the nation’s passenger railroad, to build a tunnel on terms that are more favorable to New Jersey, he said. The federal government and Port Authority of New York & New Jersey were each scheduled to pay $3 billion for the 8.8-mile (14-kilometer) Access to the Region’s Core tunnel, while New Jersey was slated to cover the remaining $2.7 billion. Christie said the arrangement exposed his state to any extra costs. The state’s share grew to at least $3.5 billion, and the U.S. government didn’t offer guarantees on cost overruns, Christie told reporters. The U.S. did offer a combination of low-interest loans, he said. LaHood’s agency also proposed funding options including increasing the federal share by $358 million, saving $700 million by scaling back the tunnel’s design and entering into a $1.85 billion public-private partnership to build the station on 34th Street in Manhattan where the tube would terminate, Christie said. New Jersey will have to repay as much as $350 million that the federal government already gave the state for initial work, LaHood said in a statement. The project could be completed for about $9.8 billion with “aggressive cost control measures,” he said. It’s unclear how the state will spend the $2.7 billion slated for the tunnel, Christie said. He said he hasn’t decided whether to redirect it to the state’s Transportation Trust Fund, which is poised to run out of money for new projects next year. The governor has said he doesn’t want a repeat of Boston’s Big Dig, the most expensive public-works project in U.S. history. The work, which replaced an elevated highway with tunnels, was estimated to cost $5 billion when ground was broken. It tripled to $14.8 billion after overruns and structural problems. According to documents released today by U.S. Senator Frank Lautenberg, a Democrat, the public-private proposal included a provision insulating the state from overages by transferring those costs to private contractors. LaHood also offered a $2.3 billion rail loan with maturities as long as 35 years, Lautenberg said. LaHood said Oct. 22 the cost of building the tunnel ranged from $9.7 billion to as high as $12.7 billion. Those projections didn’t include the $775 million cost to build a second span of the Portal Bridge, which leads trains to the current tunnel. The U.S. estimated an 83 percent chance that the tunnel’s price would be at or below the higher end of that range, Christie said today. The Regional Plan Association, a New York-based advocacy group, had said the project would double the number of New Jerseyans within a 50-minute train ride of New York and boost property values. Neysa Pranger, a spokeswoman for the group, said the project was the largest funding commitment ever by the Federal Transit Administration. State Assembly Transportation Committee Chairman John Wisniewski, a Democrat, called the decision “a monumental failure of leadership,” saying the project would have created 6,000 “immediate” jobs while reducing congestion. The move is a “brutal blow” to the state’s economy, Wisniewski said in a statement. The project broke ground last year. New Jersey, the state with the second-highest per capita income, lost 20,200 nonfarm jobs in September, the state labor department said this month. The jobless rate fell to 9.4 percent from 9.6 percent in August, mostly because people left the labor force, the department said. Christie said today that LaHood told him the state had lost its $3 billion in federal money and that the funds will likely go to other projects across the country. To contact the reporter on this story: Terrence Dopp in Trenton attdopp@bloomberg.net. Win Free Rent for a Year in a Luxury Apartment! Rachael challenged three of HGTV's hottest designers to turn three identical one-bedroom apartments into fabulous living spaces for "empty nesters," a "single parent with child," and "twenty-somethings." Now, one of their creations could become your home! Thanks to NewportNJ.com, here’s your chance to live rent-free for one year in a fabulous 1-bedroom / 1-bathroom designer-decorated apartment in the NYC Metropolitan area. The Winner will get to choose one of the 3 gorgeous apartments featured on the Rachael Ray show. Plus, they get to keep the furnishings in the apartment they choose AND they will receive $10,000! It's a total prize package worth approximately $45,000! See OFFICIAL RULES for full details, eligibility requirements, landlord requirements and prize restrictions. EDGEWATER — Although the iPark project on the former Unilever site has been in development the last seven years, the developer is still putting the finishing touches on the plan. During the Oct. 12 special planning board meeting in Edgewater, Joe Cotter presented changes to the final design and requested feedback from the board on the changes. "We've been spending a lot of time on the project and when you have a two-year time out, which is what happened with the financial market, the world virtually stops. But what we have been doing is giving this development a lot of thought." Cotter said his company has reviewed other projects nationally and globally to gain perspective as the best way to re-establish a true town center for Edgewater. Cotter referenced another development his company completed in Tarrytown, N.Y., and compared it to the Edgewater project. "It's a very similar setup. We built the borough hall, we're at a train station and we have the same amount of waterfront," Cotter added. "We learned what people like and don't like and what works." Cotter said that in the past, developers were able to get one big loan for big projects, but in the last two years, banks have been conservative, forcing developers to build in bite-size pieces, which has created implications. In lieu of those challenges, the company plans to modify the location of some buildings, including Building A-1, comprised of 75 affordable housing units, which was located closer to River Road and will now be moved in closer proximity to the Hudson River. Some of the apartments will have river views. Another change includes the separation of some of the garages to make the site more aesthetically pleasing. The site already includes the future location of borough hall, and the new Edgewater Police Department, but the introduction of a major supermarket chain could be most challenging for iPark. "The biggest change is a community-size supermarket, which is a Stop & Shop, so it's a brand we can identify, so it's not a mystery," Cotter explained. "This will provide an anchor to the project, and it's the kind of scale we need to make this truly a town center, a place where the community will come." Most importantly it will have sustainability, as people can walk, Cotter said, adding that visitors will not need a car to visit the site. But after the meeting, Planning Board President Kevin O'Conner said he thought the supermarket was a drastic change. "The traffic flow will increase drastically," said O'Conner. A board member, Jay Malakoff, added that there were already four supermarkets on River Road. "You have Whole Foods, Mitsuwa, Trader Joe's and Pathmark," said Malakoff. "And maybe two miles down the road, you have an A&P in North Bergen." But O'Conner was pleased iPark was taking a hard look at the affordable housing units the developer plans to build on the site. "If by any chance this development didn't finish, it would fall on the borough's responsibility," O'Conner added. "This way they're showing us they can build this in stages, which is what we asked for in our last meeting." The board did not make any decisions in the end, as the meeting was deemed conceptual in nature.